Americans eat out when they're feeling good about things. That's why a recent slowdown in restaurant sales is alarming some. In the past few weeks, McDonald's (MCD), Taco Bell owner Yum! Brands (YUM) and Starbucks (SBUX) have all described a new wave of caution that has crept up among customers, keeping them from splurging on meals out. The precise cause of the shift is not clear, with some blaming rising prices and slowing job growth, and others suggesting security fears or even the 2016 election are playing a role. No matter the catalyst, the deceleration is pronounced enough for Stifel Nicolaus to warn of a looming "restaurant recession" that may represent a "harbinger" to a widespread U.S. recession in 2017. "Restaurant industry sales tend to be the 'canary that lays the recessionary egg,'" Stifel analyst Paul Westra wrote in a research report published on Tuesday. The gloom-and-doom stands in stark contrast with the consensus among Wall Street economists, who see low chances of an imminent U.S. recession. But Westra went even further, warning that such a U.S. recession could be the "worst ever" for restaurants because it would come just as they grapple with rising labor costs. He urged investors to sell Panera (PNRA) and Olive Garden owner Darden Restaurants (DRI), and warned that Chipotle (CMG) could lose half its value. Pricing are rising: McDonald's executives believe at least some Americans are choosing to stay at home because grocery store prices haven't risen as fast as restaurant menu prices. Prices have gone up because restaurant owners have been forced to give workers a long overdue pay raise due to minimum wage hikes from local governments and tougher competition for talent. Of course, the flipside is that the same people should now have more cash to spend on eating out. Job growth peaking: Americans have lately become cautious about how they spend their money. Despite low unemployment and rising wages, Buffalo Wild Wings (BWLD) CEO Sally Smith told analysts in a conference call on Wednesday that people are "very reluctant to spend a lot of discretionary dollars." That's why Hedgeye restaurant analyst Howard Penney thinks there's some truth to the restaurant recession worries. "People are cutting back because they feel insecure. The first thing that goes is restaurant spending," he said. Too many restaurants! The restaurant industry recently emerged from a big IPO wave that gave newer brands like Shake Shack (SHAK), Zoe's Kitchen (ZOES) and El Pollo Loco (LOCO) the ammo to expand. But are all those new stores really needed? Rapid development may be exceeding demand, and eating into the traffic at existing restaurants, which are the ones that Wall Street focuses on. Terrorism? 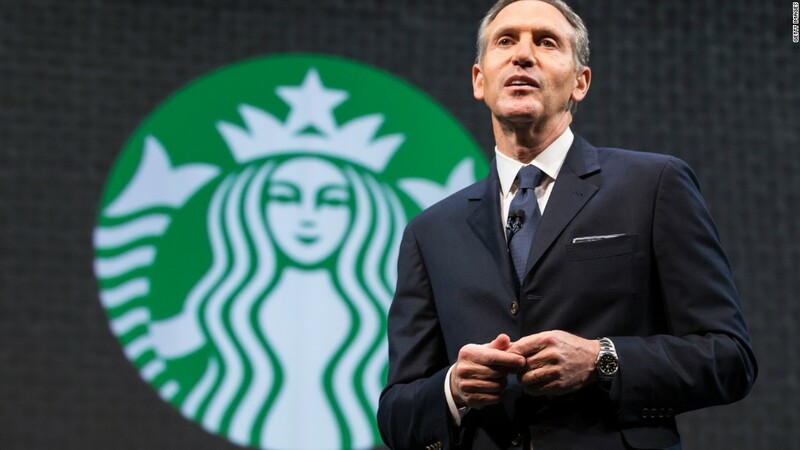 Howard Schultz, whose Starbucks coffee giant operates over 24,000 stores, is known to have his finger on the pulse of consumers. That's why it was interesting to hear the Starbucks CEO recently explain that race-fueled "domestic civil unrest" and "terror" incidents have "created a level of anxiety" among consumers. The security excuse may sound just like that -- an excuse -- but some analysts think it makes sense. "I would take his word for it. Are there concerns about congregating in public places? Definitely," said Matthew Difrisco, an analyst at Guggenheim Partners. However, Difrisco noted that these security fears tend to only have a "very short-lived" impact on sales. While Penney said he can't tie a "direct correlation" between terrorism and restaurant sales, he does think it's playing a role. "It works into the social conscience of people," he said. Political jitters? McDonald's CEO Steve Easterbrook listed "elections" and "global events" as potential drivers of consumer caution. Schultz also cited a "very uncertain election." "I don't give that a lot of validity," said Difrisco. "Political discourse has been dysfunctional for more than just the past year."